Now That’s More Like It Jerry!! (AP) EAST RUTHERFORD, N.J. – The New York Giants have made Pro Bowler Antrel Rolle the richest safety in the NFL. In the waning hours of the opening day of free agency, Rolle signed a five-year, US$37-million contract that has $15 million in guaranteed money. 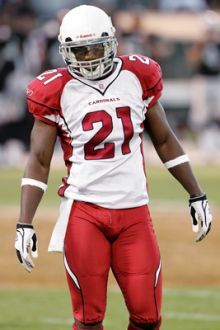 Agent Drew Rosenhaus tweeted the announcement late Friday, offering his personal congratulations to Rolle on becoming “the highest paid safety in NFL history!” The Giants formally announced the deal around 11:30 p.m.
Now that’s what I’m talkin’ about!!!! Maybe Jerry checked out 5BS and decided to wake the f*** up. This is the exact kind of signing the GMen needed- a guy with pure athleticism who can guard anyone in the NFL. In a span of 12 hours, I have gone from hating our front office to praising Jerry Reese. This is the type of signing that can change franchises. Now with a good draft pick, this D can be one of the scariest in the NFL. Gotta admit, I’m in a great state of mind. Now with baseball season just around the corner and the Giants looking good for this fall, I’m gettin excited…very freakin’ excited!!!!!!!! This entry was posted on March 6, 2010 at 1:03 am and is filed under Giants. You can follow any responses to this entry through the RSS 2.0 feed. You can leave a response, or trackback from your own site.